The classic cast iron skillet scores an Invaluablist trifecta: useful, enduring and unembellished. Is your cast iron skillet too small? I'll wager it is. The standard 10-inch skillet that your grandmother used for cooking bacon and biscuits is a great size for cooking a wide variety of dishes. But for absolute performance a larger skillet will broaden your repertoire and up your game. 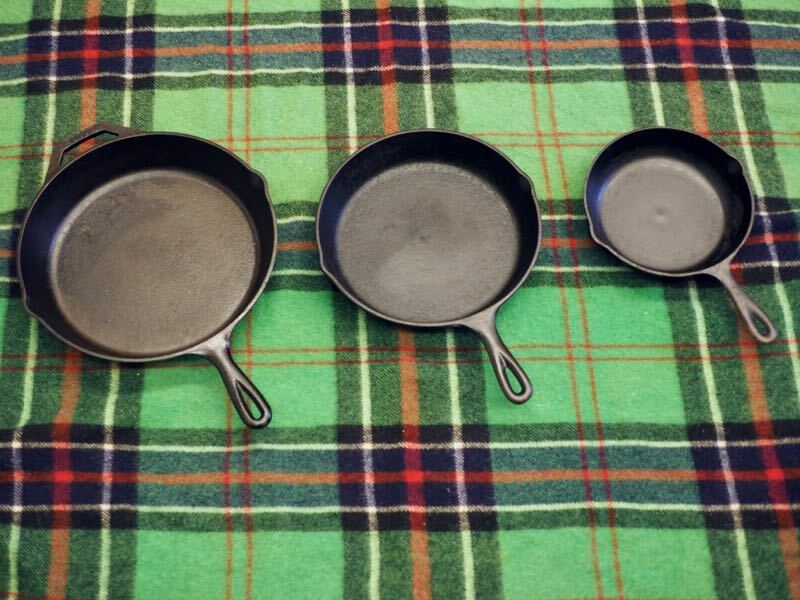 Collect them all: cast iron is very versatile and many meals profit from using more than one. Anyone who has watched a few cooking shows or followed a recipe or two has probably heard or read the admonishment: "Do not crowd the pan." And for those delving more deeply into kitchen entertainment, you might have heard of the Maillard reaction, the "chemical reaction between amino acids and reducing sugars that gives browned food its distinctive flavor". The keys to great cast iron cooking are preheating the skillet and not crowding the pan, the combination of which facilitates and encourages the Maillard reaction. In my experience, the same perfunctory dishes cooked in a medium 10-inch skillet come out much more restaurant-like when cooked in a larger 12-inch skillet. And this outcome is not just the result of putting the same amount of ingredients into a larger pan, thus avoiding the crowding circumstance. Rather, the greater mass of the larger pan seems to be critical to effectively searing whatever is cooking. In addition to many great recipes, this cast iron cookbook provides plenty of background information on skillet selection and maintenance, as well as information about cooking theory. Most of my deliberate cast iron cooking has been pursued with the guidance of this one cookbook: Cook It in Cast Iron: Kitchen-Tested Recipes for the One Pan That Does It All (Cook's Country). I was pleased with many recipes but some came up short of the advertised results. Then I bought a larger skillet and immediately achieved the results I had hoped for. In addition to many great recipes, this cast iron cookbook provides plenty of background information on skillet selection and maintenance, as well as information about cooking theory. With a modicum of maintenance, a cast iron skillet will last more than a lifetime. I cook on an eight-inch skillet bequeathed by my grand parents. The near-indestructibility of cast iron makes these skillets obvious candidates for vintage-store and flea-market finds. Usually even rusty skillets can be re-conditioned to exceptional condition surprisingly easily. Lodge, a leading manufacturer of cast iron skillets has been in business since 1896. Today, Lodge also makes a broad selection of other cast iron cooking products. But I think one fact is telling about the simplicity of the enduring skillet design. Somewhere along its way, Lodge added a second, small handle to its skillets. This handle is especially convenient when pouring liquids out of the skillet. Importantly, it also adds a welcome point of purchase when moving a heavy skillet with heavy cargo, like a roast chicken. And that is it, other than the second handle, the basic, proven form of the cast iron skillet has not changed in well over 100 years. 12-inch - The workhorse many cooks lack. 10-inch - Every kitchen needs one. Three Skillet Bundle - For the complete kitchen; great wedding gift. Cook It in Cast Iron - Great starter cast iron cookbook.